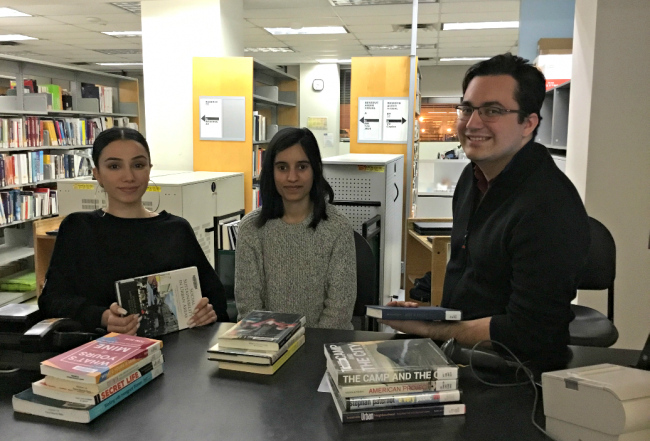 It’s time for summer projects at the Ryerson University Library and Archives (RULA) and we’re fortunate to have wonderful student staff here to help. Read on to learn about some of our projects and the roles of student staff. Anish is our Weekend Circulation Assistant. He’s available to help you access Library materials and answer borrower questions on Sundays. On weekdays this summer, Anish is meeting people from all over the world and helping them learn about Toronto as staff at a hotel. 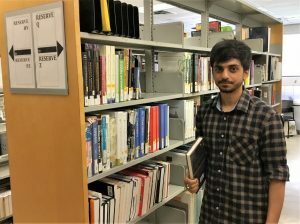 Anish can help you find books and other Library materials. Claire assists visitors in two popular Ryerson buildings–the Library and the Student Learning Centre–as a Library/SLC Specialist. As part of the front-line services team, Claire provides information about programs and facilities in the Library, SLC, and the University. You’ll also spot her assisting with special events and conducting head counts. Claire’s excited to help people learn more about the campus and the Ryerson community all summer. Claire supports students, staff, and faculty who book seminar rooms. 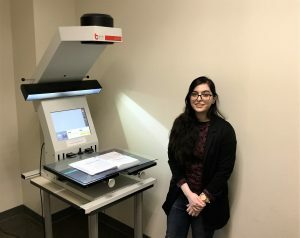 Hafsa works behind the scenes as a Library Digitization Projects Assistant. 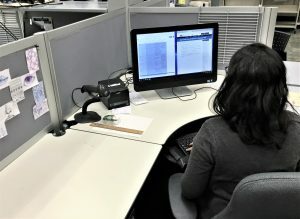 Hafsa is helping to serve patrons in a variety of ways by supporting eReserve, Interlibrary Loan, and Accessibility Services. The range of projects and the opportunity to work alongside RULA staff are some of the reasons Hafsa is enjoying her summer at RULA. Hafsa helps provide digital access to print materials. Mathura works with staff in Development and Library Client Services as a Special Project Assistant. 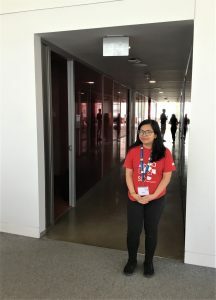 By bringing the student perspective to projects like reviewing Library policies and the Library student employment program, Mathura is contributing to the continuous enhancement of front-line services at RULA. Outside of work, Mathura looks forward to exploring Toronto this summer. Mathura helps identify ways to best serve Library patrons. Are you a Ryerson student interested in joining the team? Keep an eye on our Student Jobs page and social channels. With Victoria Day unofficially kicking off the summer this weekend and RULA closed on Monday, we hope you have more time to relax and recharge. If you’re looking to relax by watching a film and can’t make it to the cinema, RULA has you covered. 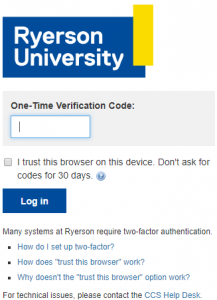 View our guide on online streaming services available to the Ryerson community and list of available documentary films. Looking for a great film and not sure where to start? Below you’ll find lists of the top streamed films in the RULA collection. Longer Hours: The DME is now open later, until 8:00 pm Monday to Friday. Longer Loan Periods: A new 48-hour loan period replaces one-day equipment loans. Please note that self-service renewals are not possible and you should speak to DME staff if you have any questions. Pro Tip: Borrow an item on Thursday and keep it for the weekend – it’ll be due Monday at 11:00 am. New Equipment: Snowball microphones, a range of camera lenses, and Leap Motion sensors are just some of the equipment now available for you to borrow. Have suggestions for additional equipment? Post below or reach out to DME staff. Streamlined Borrowing: Instead of needing to visit the Library Circulation Desk each time you borrow, head straight to the DME. Remember to bring your OneCard. The first time you borrow equipment, you will need to complete and submit an online DME Technology Equipment Lending Agreement Form and go to Library Circulation Desk to complete registration. Is the DME all new to you? The DME is a makerspace, fabrication lab and digital media production facility open to all Ryerson students and faculty. Drop by anytime the DME is open or sign up for a tutorial to learn more. Seven days a week, the Library is open to 1:00 a.m. We couldn’t do this without the help of our trusty Student Library Assistants. They’re here late into the night and on the weekends. Maybe they’ve helped you find a book after class or you’ve seen them take headouts in the Library. Maybe they’ve help you with printing after CCS Tech Help has gone home or you’ve seen them tidy up study spaces after most people have left. Our Student Library Assistants are an integral part of the RULA team and we consider them student experts on using RULA. Today, we feature three of our student staff as they share tips for using the Library and exploring the city. Favourite Spot in Toronto: My favourite spot would have to be Kensington Market. I love the vibrant colours and the wall art as well as the little restaurants. It’s an inspiring neighbourhood for creatives. Advice for Library Patrons: An advice would be to respect the space, throw away your garbage, and leave your station clean for the next person using it after you. Favourite Spot in Toronto: My favourite activity in the city is taking the ferry to Centre Island. 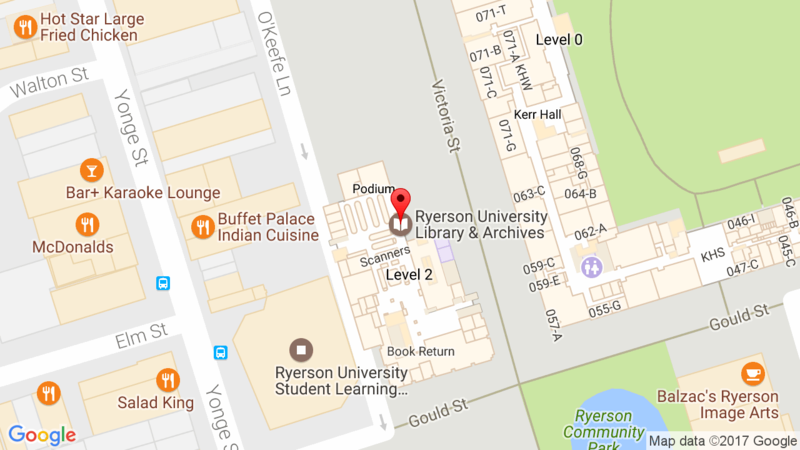 Advice for Library Patrons: A tip I have for students is to not give up when a book you need isn’t available at the Ryerson Library. Through RACER you can request a book from other university libraries. So before buying a book outright, try your luck by making a request through the RACER program. Favourite Spot in Toronto: The Scarborough Bluffs are amazing! Advice for Library Patrons: In the Library, quiet is key. Most of us here in the evening are trying to finish that paper due at 11:59 p.m. on D2L, and a stress-free work environment can be the difference between a pass and a fail, so I’d say quiet helps you and everyone around you. For details about any of the policies and resources mentioned, check our website or speak to Library staff! RULA Closed on Family Day – Enjoy the Long Weekend! The Library, along with the rest of Ryerson University, will be closed on Monday, February 19 for Family Day. Regular hours resume on Tuesday and continue for the rest of Reading Week. Looking for something to do with the family this weekend? RULA has you covered! From old classics like The Wizard of Oz to new hits like Get Out, feature film DVDs are available as 3-day loans. Ryerson students have access to the MAP program, which allows them to pick up a pair of passes to Toronto’s top cultural venues like the Royal Ontario Museum and the Aga Khan Museum. No time to visit RULA in person? 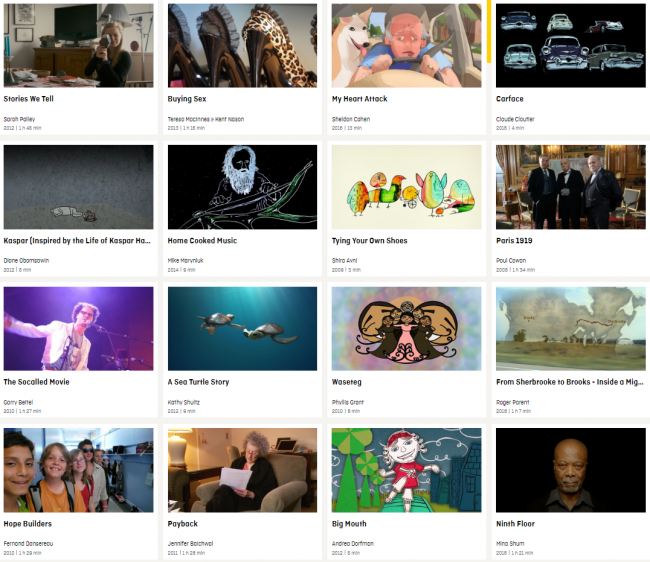 Stream films from Kanopy! Newly added titles include the documentary For the Love of Spock and the comedy Hunt For the Wilderpeople. 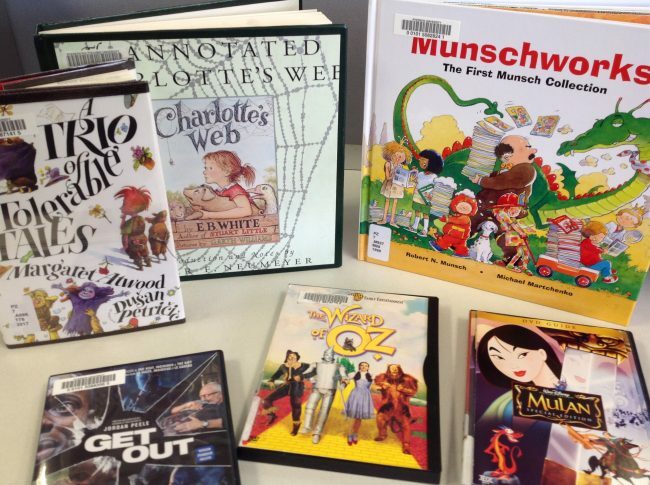 Have questions about any Library resources? Feel free to ask Library staff! We’re here to help, just not on holidays like Family Day!